The Idle Parent Manifesto: Leave Them Be. 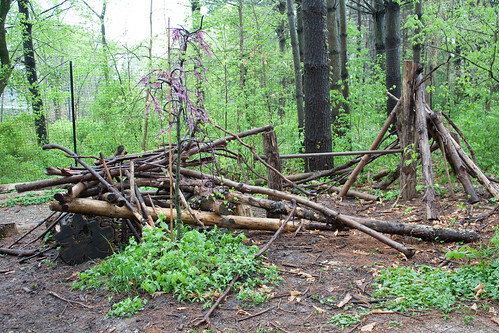 Left to their own devices, kids come up with amazing ways to keep themselves entertained. 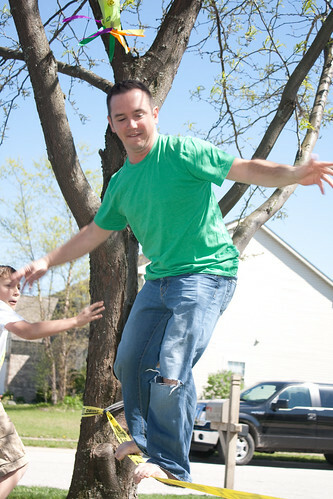 This is the second part in a series of discussions regarding The Idle Parent Manifesto, which can be found in Tom Hodgkinson’s book The Idle Parent: Why Laid-Back Parents Raise Happier and Healthier Kids . Need to get caught up? You can do so here. Before we delve into this part of the manifesto, let me define what I think the author is saying here. I believe he means we leave children to their own devices as much as possible when we are together, as opposed to leaving the children alone in the home while we are out. It sounds easy enough, doesn’t it? Isn’t that what we crave as parents of young children, to just be left alone for a small part of our day? To have a portion of the day when we’re not being chatted at, tugged upon, cried for? And yet, if you really think about your day, there are many missed opportunities for us to leave the children alone. I’m as guilty as anybody, especially with my oldest. She has always been an independent spirit. Even at an early age, she would get immersed in some kind of play, giving me long stretches of time to do my own thing. Instead of relishing these moments, I felt pulled to interact, to interject myself into her private world. Inevitably, this interruption served only to disrupt her play and remind her that I was there at her beck and call. Why not just leave her alone? It can be unsettling to feel unneeded. As a stay-at-home mom, I often feel guilty if a stretch of time has gone by where I haven’t tended to some need. I imagine a parent who works outside the home might feel a similar kind of guilt if they’ve been gone for a stretch only to find that once home, their children are off in their own world. As parents, we haven’t been made to feel that these moments are victories. Instead, we see them as one more missed opportunity, one more chance to be doing something. Again, guilty as charged. 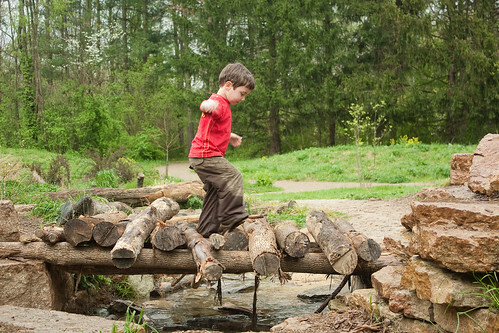 How many moments during the day do we do just this – take situations where children are perfectly capable of managing themselves and instead micro-manage them? And then we wonder how they became such demanding little creatures. We’ve hammered it into their little brains that they are not capable, or that life couldn’t possibly be so simple. My youngest is not the independent soul that his sister is. Or was he? He is both the youngest and my last, and I’ve noticed my tendency to hover and baby him. And while it was cute to be followed around by a toddler, having a near-kindergartner who can’t tie his shoes or entertain himself isn’t nearly as charming. On the days when we’re home together, he needs me constantly. Sometimes he panics when he realizes he’s been left alone downstairs. I feel as if no matter how much I engage him, when it’s time for me to get something done he can’t come up with his own entertainment. The author suggests you try an experiment: say yes more often and see if they bug you less. His reasoning is that if kids know they can have your undivided attention for any reason, no matter how small, they stop asking. Here’s the kicker, though: let them come to you – do not interfere, but when they do come, be there for them. I’m ready to try it, especially with three months of summer vacation ahead of us. I wonder how much of Eli’s need for me to pay attention to him stems from too many interactions where I haven’t given him my full attention. Playing LEGOS while checking Facebook, listening but not really listening. Or is it a combination of that and hovering? 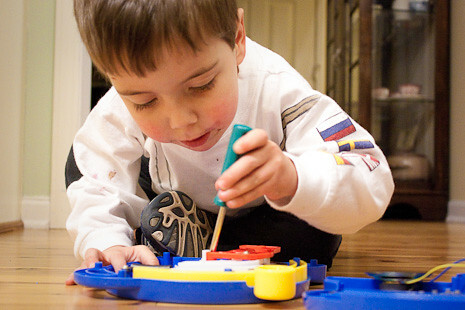 When someone is always there, ready to offer the next entertainment or toy like a cruise ship director, how can children learn what boredom feels like? More importantly, how can they learn to creatively battle boredom with their own ideas? The author believes that passive parenting is responsible parenting. What do you think? Does being a passive parent and leaving children to figure things out on their own build character? Or do you believe it’s just another excuse for parents to do their own thing? If you’re going to be a risky parent, it’s good to find risky friends! No-holds-barred play loves company. We had the best kind of company over Spring Break, my good friend Lisa. She doesn’t let anything hold her back – not even knee surgery can stop her! She might not be able to run anymore, but that doesn’t mean she can’t kayak. Or skateboard. 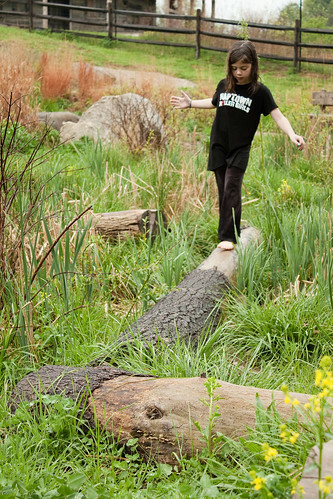 Or even better: master the slackline. 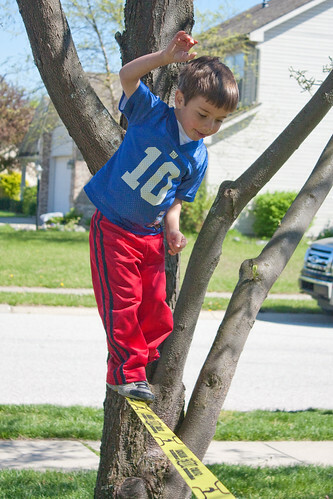 Lisa came to visit with her son, Thomas, and they brought the coolest risky gadget ever: a Gibbon slackline. She had it set up between two trees in a jiffy and the kids (big and little!) were all over it. It’s not easy, but the best things in life take some practice. The kids spent hours playing on it, and my kids were so sad to see it (and our company) go. 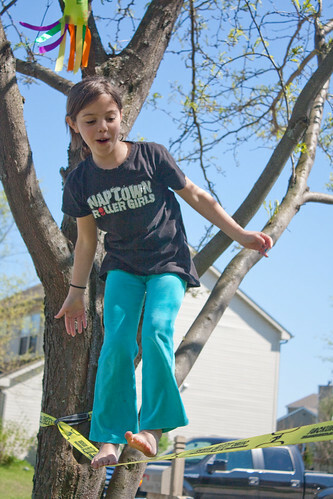 More than just a fun way to spend an afternoon, the slackline promotes balance and coordination, builds self-confidence, encourages perseverance, and most importantly, it’s crazy fun. As soon as I get that flip down, I’ll let you know. 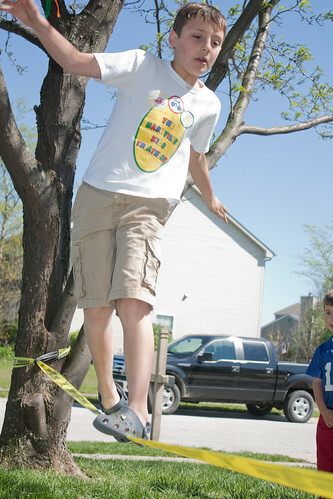 Learn more about Gibbon slacklines here. They’ve not only succeeded in meeting that goal, they’ve gone and made me jealous that we don’t have such a space in Indianapolis. The kids loved it, despite the fact that shortly after we arrived we were met with a torrential downpour and falling temperatures. They played until they couldn’t feel their fingers or toes (we were very ill-prepared clothing wise for wet and cold – I promise it was gorgeous and sunny right up until we arrived), and had they been just a little warmer I know the rain and muddy puddles would’ve only enhanced the entire experience. You might look at the space and wonder how today’s children could possibly be entertained here. There are no slides, no monkey bars, no swings. 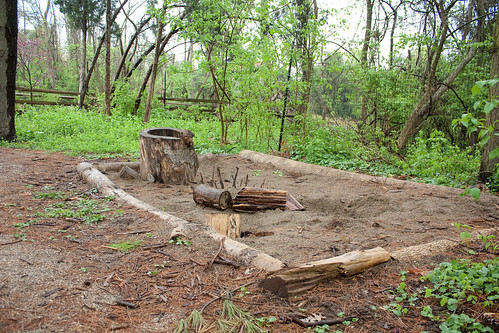 Instead you’ll find fallen logs, rocks, large sticks, water, dirt and gravel. 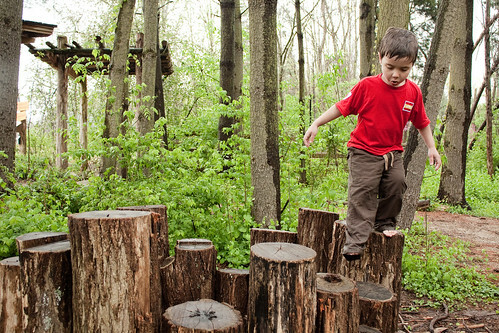 The kind of unstructured play kids engage in here is critical for the development of creativity, critical thinking and motor skills. More importantly? It’s just plain fun. Even my kids, who are used to leniency on the playground, were both surprised and ecstatic to learn that they could move rocks, carry sticks, stomp in the water and get dirty. 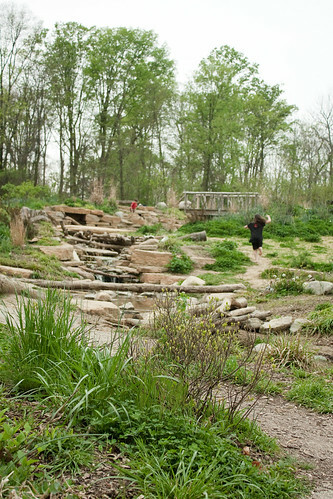 Beyond the Nature Playscape, the Cincinnati Nature Center is an additional treasure. Stop by the Visitors’ Center to learn more about the habitat and animals that make their home there. 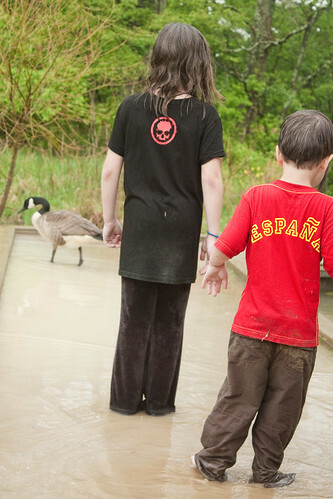 Grab maps of the various trails, observe birds, visit with the naturalist, and allow time for kids to play inside. We left cold, wet, dirty and happy. The kids can’t wait to go back, and while we’ll definitely visit again, I have visions of making something like this a reality in Indianapolis. 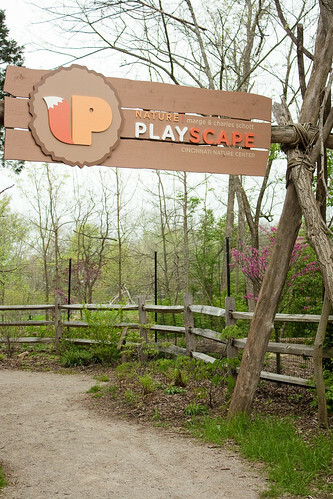 The Cincinnati Nature Center, along with the Marge and Charles Schott Nature Playscape, is located at 4949 Tealtown Road in Milford, Ohio. The grounds, as well as the Visitors’ Center, are open 7 days a week; hours vary seasonally. Visit their website for more information and to plan your visit.